Nezumi, 16yr Mn Chi presented for caudal cervical lesion treatment complicated with challenges of congenital MPL, hock hyperextension, elbow dysplasia and temperament. 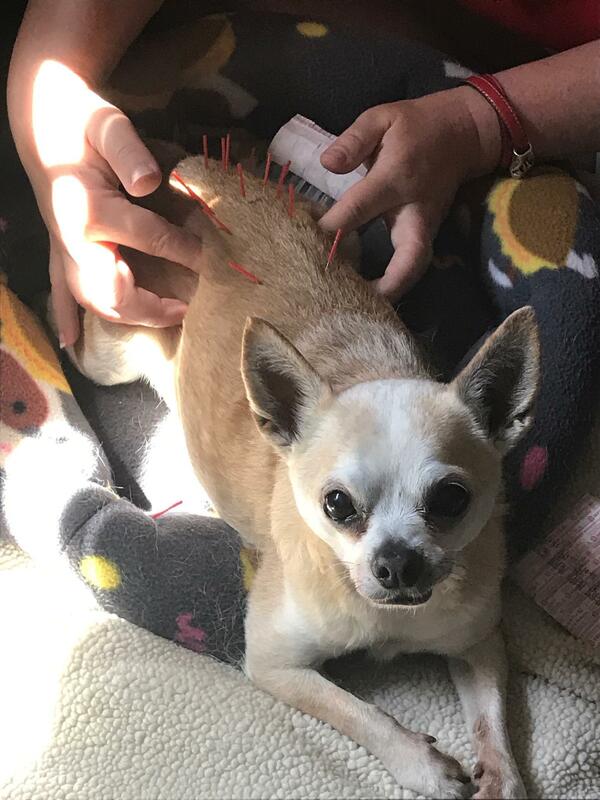 He has had acupuncture before where the owner (O) was instructed to hold him down since he would bite. Nezumi’s problems started acutely 3 weeks prior when he started stumbling with his right front leg. Nezumi has history of patella luxations and elbow arthritis for years. There is also a history of suspected atopy as he licks his front feet however this is confined to the medial carpus (left more then right). There is no known trauma. He has been owned since a puppy. MS: amb x4, Double engine gait with paresis of right thoracic limb (RTL) and ataxic wide based PL stance. Hyperextended hocks with bilateral ¾ medial luxated patella (MPL). Right (R) stifle thickening. Bilateral elbow thickening with abduction (L>R) and L elbow heat. Pain elicited on C6 palpation. Mild focal pain on thoracolumbar (TL) junction. NEURO: Absent conscious proprioception RTL and delayed LTL, Normal PL. Intact pain sensation x4. Intact panniculus. Normal to hyper patellar reflex. Myofascial palpation: Acute pain in caudal cervical region however compensatory muscle strain/trigger points were severe of neck, thorax, lumbar, semitendinosus and crus. Elbow dysplasia with osteoarthritis (OA). Severe on left/moderate on right. Over time, congenital MPL caused more strain of lumbar core muscles and the TL region due to stabilization for gaits. This results in myofascial pain syndrome (MPS) of the lumbar, thorax, and front limbs (8, 10, 13). As time went on, the progressive arthritis of the elbows causes compensatory elbow abduction. While the original cause is unknown, I suspect that the progressive elbow abduction as well as afore described compensations exacerbated the chronic cervical nerve radiculopathy. The left radiculopathy caused weight shifting to the R side resulting in more trigger points of the RTL and lumbar area. The acute C6-T1 lesion then created more muscle strain of the neck muscles and further exacerbated MPS of the hind legs. Bi-weekly sessions for 2 weeks then reduced to weekly maintenance. At home sessions consisted of 20-30min acupuncture needling, 10min EA stimulation and 10-15min massages. Caudal cervical lesions are commonly encountered in veterinary medicine with the majority related to disc rupture (5). Multiple studies have shown great, if not better benefit of electroacupuncture and photomedicine to these neuronal injuries (3, 5). Ideally photomedicine can be used to improve axonal healing however neural growth can still occur for motor and sensory function using stimulation with acupuncture, EA and controlled exercise (14, 6, 1, 2, 11). Nezumi showed progressive improvement and within 2weeks, he was ambulating well without assistance although foot placement when standing took closer to 4 weeks for recovery. Prior to curacore training, medical recommendations included medical treatment and 4-6 weeks of strict rest. This rest reduces fibroblast populations in joints, ECM, and muscle as well as not stimulating axonal growth and repair (1, 2, 7, 12, 15). While Nezumi’s temperament created a challenge, with patience, we were able to elicit a change and return to almost normal function. Video is provided for pre treatment, 3 weeks post and again 4weeks post treatment. This experience was a win-win-win situation. Nezumi’s pain level was quickly controlled and function returned, the owner-pet bond was strengthened and I could see and feel benefits of my work. Medical acupuncture is a tangible way to work with neurophysiology and anatomy of a patient. It is an amazing experience. This also created a different level of communication with the owner regarding neuro, immune and vascular benefits that strengthened the trust level between us. Nezumi has been doing well however about 3 months after initiation, his clinical signs acutely worsened of the same leg and I worried that either a new disc ruptured or this was a sign of other pathology (neoplasia). We increased his treatments and fortunately, function progressively returned again after 3-4 weeks. The most exciting news is that the past few weeks, Nezumi actually crawled into my lap with licks of affection and let me do most of the treatments… except, of course, with the head. Qian-Qian Li et al. Acupuncture Effect and Central Autonomic Regulation. Evid Based Complement Alternat Med (2013).